For any self-respecting kid in the late '70s/early '80s, the last thing you wanted to enjoy was Hee Haw. There it was, every Saturday night at 6:30 (or thereabouts, depending on your local affiliate and their syndication agreements), chucking out non-stop corn-pone humor littered with country stars of the day. Right there in the middle of it all were Roy Clark and Buck Owens. I have to admit: I was more of a Roy Clark fan, finding him the much more compelling instrumentalist and a much more natural comedian. 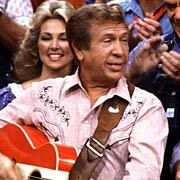 But when you started to look at what Buck Owens meant, not only to Hee Haw but to other influential figures within pop music, you had to give him his props. I've had "Act Naturally" stuck in my head ever since word came of Buck's death this past Saturday. I never met Buck, but was in the press room at the CMA Awards the night he was inducted into the Country Music Hall of Fame. His spiritual protege Dwight Yoakam did the honors, and the two of them came back to face the ink-stained and/or blow-dried wretches of the music press. Bob Dylan's ramble/rant at the Grammys a few years earlier was crystal clear compared to the run Buck went on that night, and while to this day I still don't know what he was talking about (or was on, really), I'd like to think in Buck's head it was something profound. Thanks for pickin', Buck. We'll keep grinnin'. I think a famous (doubtless southern) person probably once said, "A person who doesn't like Roy Clark in their youth has no heart. A person who doesn't like Buck Owens in their adulthood has no ear." I'm SO with you on this, Lucas.